The Nova Scotia Duck Tolling Retriever is one of the most unusual breeds of gundog, at least in terms of how the dog works. The breed was developed in the Little River district of Yarmouth County, Nova Scotia around the beginning of the 19th Century, and was officially admitted to the Canadian Kennel Club in 1945. The exact origins of the breed are not known, but it appears that some Cocker Spaniel, Golden Retriever, and/or Irish Setter may have gone into the mix. It may share origins with the smaller Kooikerhond. The coat is of moderate length and consists of a waterproof outer coat with a dense undercoat for warmth. The tail is heavily feathered and the legs are moderately feathered. The coat color may be any shade of red, with deeper colouring preferred. There is usually some white on the chest, feet, nose, head, and tip of tail. Tollers range in height from 17 to 21 inches (43-53 cm), and weigh 37 to 51 pounds (17-23 kg). The Toller is a gentle but active breed. They are highly intelligent and easy to train, although many get bored with repetition. Prospective pet owners must take note that the dog requires extensive daily exercise, as well as regular grooming. They are excellent with older children, but can be wary of strange adults. They do not have the all-forgiving temperament of a Golden Retriever and should not be left unsupervised with young children who have not yet learned how to interact with dogs. Potential owners should take note of the "Toller scream," a high-pitched and very loud utterance made up of a growl, whine, bark, and howl. The dog will do this to show great excitement and, depending on the dog, any other reason. 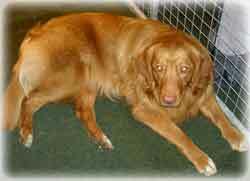 The most interesting aspect of the Nova Scotia Duck Tolling Retriever is its method of work. The hunter stays hidden in the blind and sends the dog out to romp and play near the water, usually by tossing a ball or stick to be retrieved. The dog's crazy antics and white markings pique the curiousity of waterfowl, who swim over to investigate. The act of enticing or luring game to approach is known as tolling. When the birds are close, the hunter calls the dog back to the blind, rises, putting the birds to flight, and shoots them. The Toller then retrieves any downed birds.